With the »B3 – Biennale des bewegten Bildes« or »B3 – Biennale of the moving image« the German federal state of Hessen has created a new international festival for the creative and artistic sectors. »B3« establishes a new, sustained and integrative platform for television, movie and media workers as well as for artists. The Biennale consciously questions the division of this scene into different disciplines and promotes networking. The concept rests on three pillars and the »B3-Festival« has been created by international curators. Visual arts, film, animation, science, games and advertising will be given equal biling. The »B3-Parcours« will be furnished by Deutsches Filmmuseum, Frankfurter Kunstverein, Museum für Kommunikation Frankfurt, Weltkulturen Museum and by the Museum für Angewandte Kunst Frankfurt with their own complimentary contributions. The »B3-Campus« is not only open for students and educators as a platform for exchange, but also serves as a window into the universities who offer professional training in the creative arts. 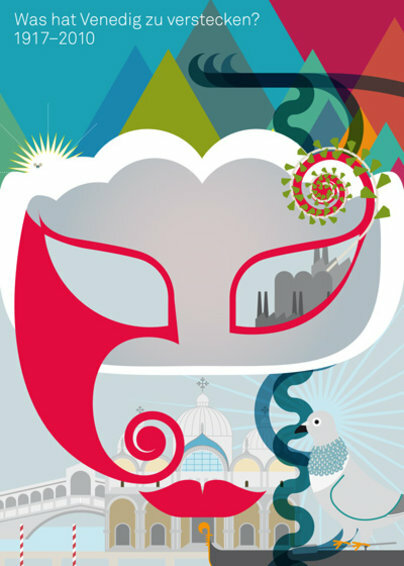 The festival is produced by the federal state of Hessen, LPR Hessen and the city of Frankfurt. Hosts are the Hochschule für Gestaltung Offenbach in cooperation with the Hessische Film- und Medienakademie. Deutsche Bank and satis & fy are sponsors. »B3 – Biennale des bewegten Bildes« will start in October 2013 for the first time. Walter Ganster served for 36 years as a teacher for special tasks at the Hochschule für Gestaltung Offenbach. Now he’s retiring. He has built HfG's studio for reproduction print and was responsible for offset and screen printing. In the late 1970s he acquired the school’s first scanner and familiarised himself with new technology. Walter Ganster reinvented himself for the third time in the late 1980s. He was one of the first educators at the HfG, who started working with digitalised prints and photos. His studio was always state-of-the-art and he was able to repair most of his own equipment. His door was always open for both students and colleagues. He has never considered a question as “too stupid” and he is always generous with his time. Patiently he showed and explained how ideas can be turned into perfect paper prints. No matter whether it took three minutes, three hours or three days, Walter Ganster always found the time. In doing so he never meddled with his students' designs. He simply showed the way to optimal realisation. Walter is a humble man who does not seek the limelight. But he will inform you of his views when it matters, not just weeks later. He is the best partner a designer can wish for. At the HfG Walter Ganster is irreplaceable. 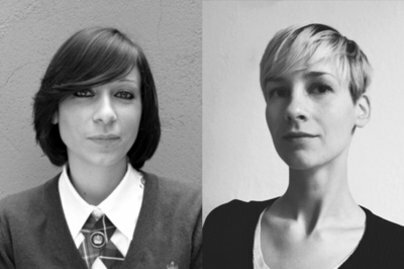 Katja Baumann and Kim Angie Cicuttin, both HfG alumni, belong to the 5 finalist of the Newcomer German Design Award 2013. 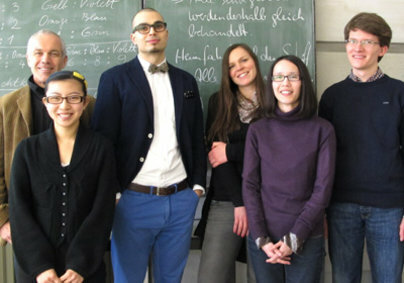 An independent jury from the »Rat für Formgebung« (German Design Council) nominated 5 young designers from all over Germany for the Newcomer German Design Award. This year, two graduate students from HfG's section for communications design are amongst the finalists. All five have been invited to Frankfurt for a price giving ceremony in February 2013. The prize giving takes place together with the trade fair »Ambiente« and will be flanked with an exhibition of the winning designs. The newcomer finalists will also be present with a selection of their work. 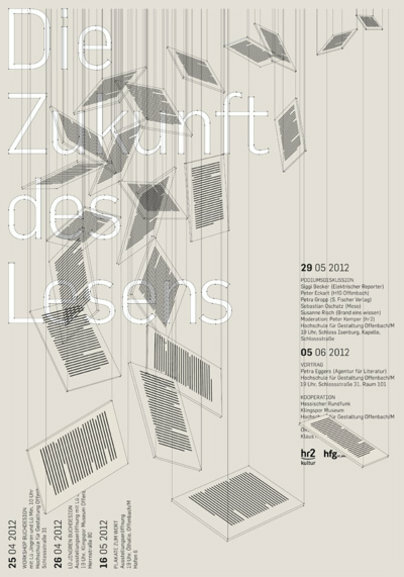 In addition they will be introduced to the public in an online exhibition at www.designpeis.de and within the published catalogue of the German Design Award 2013. The winner amongst the five finalists will be announced in the price giving ceremony in February 15th 2013. The award comprises 15.000 Euro, the four other nominees will each receive 2500 Euro. Both nominees from HfG took their exams after having studied with Prof. Klaus Hesse. The »Rat für Formgebung« was founded in 1953 as a foundation by the German parliament, Deutscher Bundestag. It supports the industry in all matters of design and is one of the world leading centres of competence for communication through design. Exhibitions, convents, competitions and publications keep the subject of design in the public debate. Members of the foundation are designers, entrepreneurs. Not every opinion is an attitude, but every attitude is the result of an opinion. People with real attitude have become rare. sushi 14 gives them a platform: people with their own ideas. People with something to say. People with polarising positions who have become well-known thanks to their commitment and independent thought. Some will only provoke disbelief, others will astonish us, but most of them are to be admired. 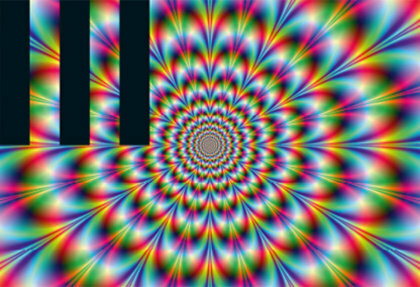 The act of reading sushi 14 will also demand an open mind since the magazine rotates around its own axis. The publication boasts contributions from Juliane Rebentisch, Siggi Becker Niklaus Troxler, Erik Kessels, Aram Bartholl, Julius von Bismarck and many others. And as always, sushi 14 presents all academic and practical work from students and graduates that won awards in the ADC-Nachwuchswettbewerb 2012 (young talent award by the Art Directors Club Germany). 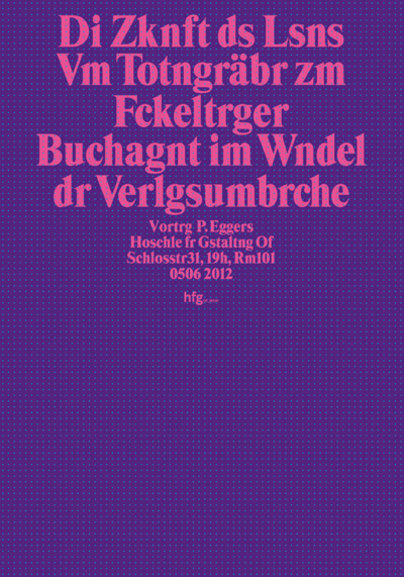 Text and design by Nikolas Brückmann, Yuriy Matveev and Sophia Preussner. Since 1999 the annual magazine gets designed, written and produced by different groups of HfG students. Professor. Klaus Hesse initiated the project and has since supported each editing team. Sponsor is »Focus« magazine, Burda. 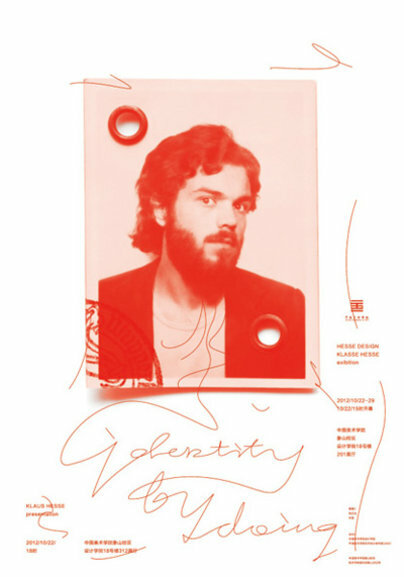 Almost 7000 works from 43 countries were handed in for the Red Dot Communication Design Award 2012 to be appraised by a prestigious international jury. Kim Angie Cicuttin's work for her diploma at HfG »Was hat Venedig zu verstecken« (What has Venice to hide”) is amongst the winners. The award ceremony will be held on October 24th 2012 in the Konzerthaus Berlin. The work is a series of posters using info graphics to depict the catastrophic amount of pollution Venice had to deal with in the past 100 years. It focuses on the reasons for this issue and posits solutions. The work focusses on the idea t allow nature to take back its space, to deal with the damage and to reposition the city as a leading hub for trade in Europe. An annual stipend by Fulbright allows for one year at a university in the United States of America. 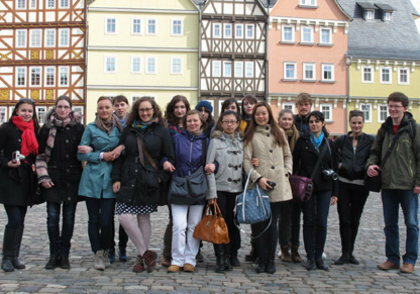 Inaugurated in Germany in 1952, the scholarship awards up to 55 students per annum. The programme is dedicated to the American senator J. William Fulbright. Fulbright belonged to the Democratic Party and worked throughout his whole political career for higher education and international exchange. Amongst many others Ulrich Wickert (journalist), Jonathan Franzen (author) and Doris Dörrie (film director) are Fulbright alumni. 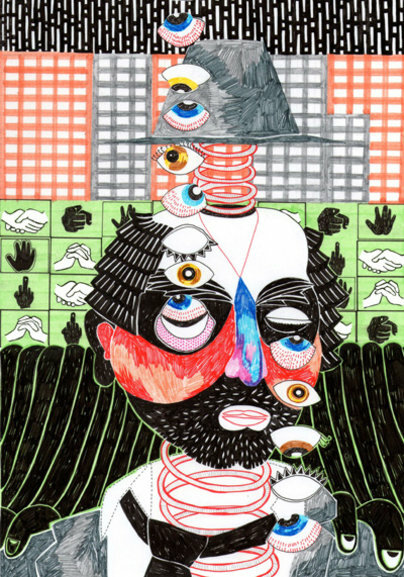 Laura Hartmann studies illustration and conceptual design at the HfG. Her posters and illustration are widely exhibited. Currently two of her works regarding New Zealand are shown in the Museum für Angewandte Kunst in Frankfurt (MAK). From September Laura Hartmann will study at the University of Massachusetts' College for Visual & Performing Arts for a »Master of Fine Arts Visual Design Program«. She will focus on illustration and graphic design. Lü Min und Lü Jingren Jingren Art Design Studio Prof. Lü Jingren was born in 1947. Book designer, illustrator, professor at Academy of Arts and Design of Tsinghua University, member of Alliance Graphigue Internationale [AGI], deputy director of Book Binding Art Committee at The Publishers Association of China, Member of Illustration and Binding Art Committee at Chinese Artists Association, chief director of Jingren design studio. Lü Jingren is dedicated to the field of book design and teaches editorial design, info graphic, book illustration, etc, at Tsinghua University. 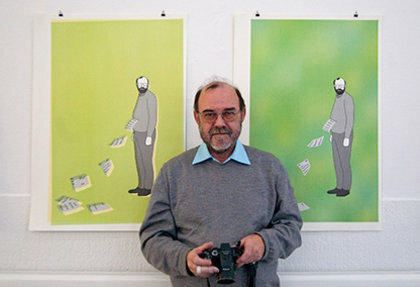 Books he designed have won many international awards. (2009 The Chinese Memory -Treasures of 5000-years Civilisation, Winner of Appreciate Honnor, The Best Designed Book From The World ). Jingren Art and Design aims at a comprehensive visual effect-breaking the tenet of “decorating the cover only”, and instead embodying the concept of creative design, in-depth grasp of whole visual information and the five-sense reading experience. His work strives for a balance between intellectualism, tradition and modern visual expression to achieve “oriental style without drawing directly from the past”. Thomas Reuter won the internal competition at HfG to create a new corporate design for the high school in Offenbach. The medical doctor and winner of the Nobel Peace Prize in 1913 founded a jungle hospital in Lambaréne, Gabun, and since that acted as patron for many public institutions. It is a historical fact that a pelican was the feathered companion and friend of Albert Schweitzer: he even wrote a book about the animal. 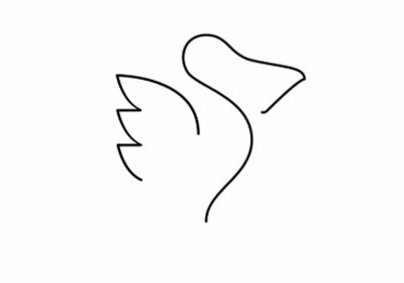 Thomas Reuter designed a memorable form of a pelican, creating a stylised »S« to signify »Schule« (School) or the name »Schweitzer«. The managing conference of the school decided to start using the new logo immediately. 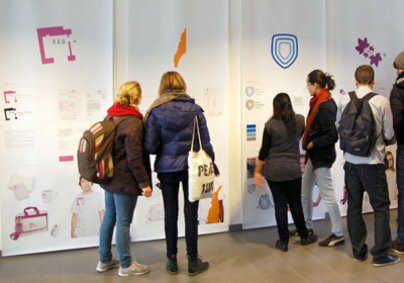 The exhibition with nine design concepts by students of the HfG can be seen in the Albert Schweitzer Schule's foyer.